OpenVPN is an open source software application that implements virtual private network (VPN) between your client computer (e.g. a laptop) securely to your Amahi server. 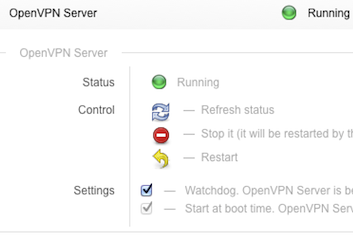 OpenVPN is an open source software application provided by OpenVPN Technologies. OpenVPN Technologies is a company integrating a suite of leading-edge networking and software technologies. OpenVPN Technologies has designed and deployed a virtual network software that provides secure, reliable, and scalable communication services, not only fulfilling the requirements of the traditional virtual private network (VPN) market, but also addressing the demands of next wave web-scale VPN services. OpenVPN, their award-winning open source VPN product, has established itself as a de-facto standard in the open source networking space, with over 3 million downloads since inception.